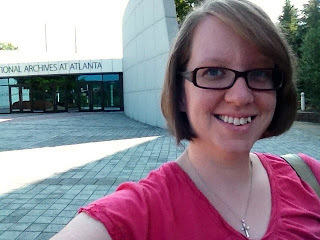 Today I visited the National Archives at Atlanta for the first time. I've gone to the Georgia Archive a number of times, which is right next door. My visit today was for a specific purpose: to look at microfilm containing Indian Wars Service Index Cards. I'd looked online at NARA's website to learn that they had this microfilm, and was hoping they might have other records to help my search. I want to find out what my ancestor Wiley Powell had been up to. 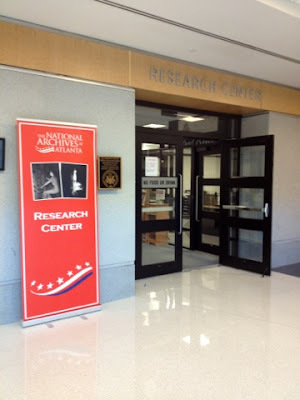 For those of you who might be interested in visiting the Archive, here's the setup: You enter the main doors and are immediately greeted by the security desk. You'll sign in and receive a visitors badge, then go through a metal detector and have your purse searched. 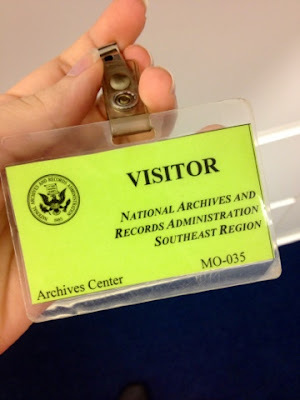 The security guard then points you across the lobby of the building to the records room. The only thing is, once you get to the research room, you've passed the lockers. I had to ask about them, then go back towards the entrance. They are kind of hidden; when you first enter, you have to make a sort of U-turn to your right. Once inside the research room, you sign in again. 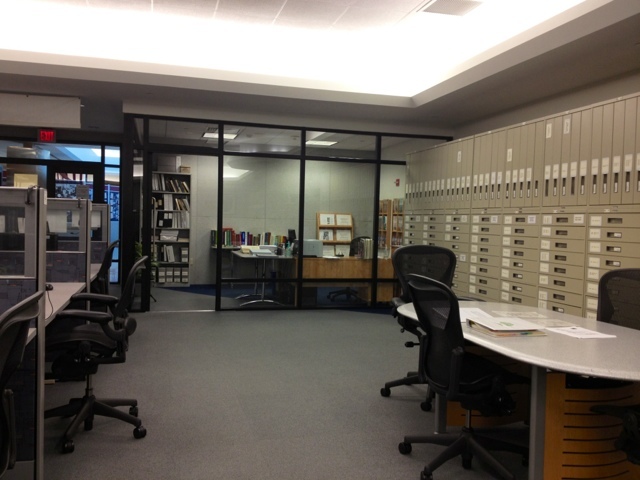 On your left, there is an office (shown in the photo below) where the binders with the microfilm indexes are located. I must have looked a little confused, because the woman at the desk asked if I needed help. I showed her the Indian War Pension Index Card I already had and gave her the microfilm number I'd found online for the Indian War Service Record Index Card microfilm I was looking for. She then looked up the location of the microfilm for me, and showed me how the numbering system worked. Unfortunately, as I had expected, there weren't any more records that would help me with this search. The worker pretty much told me that, for the most part, all they really had were indexes and I would need to send to DC for the actual records. The service record card didn't provide me with much more information than I already had from the pension card. Finding my ancestor's card in this film did confirm the time period of his service (though not the exact date) since the microfilm was titled "Index To Compiled Service Records Of Volunteer Soldiers Who Served During The Cherokee Disturbances And Removal In Organizations From The State Of Georgia." At this point I can be pretty much certain that Wiley Powell served in the Georgia Militia during the Trail of Tears. Based on what I've found, I have requested a copy of Wiley Powell's compiled service record. Hopefully there will be some valuable information included in those records - heck, hopefully those records exist. If they don't, I'll order the pension records (which cost more). In the photo below, you can see most of the research room. In the back left is the entrance, with the office to the right. Along the right wall is the microfilm, and a bank of computers is on the left. Not shown are the microfilm readers, which were behind me when I took the photo. The microfilm readers (I think there were four or five of them) are all electric and hooked up to computers and printers.